This may be the weirdest Ken Loach film I have ever seen. It comes along pretending to be yet another reflective and unexcited look into the minds of simple folk, and then all of a sudden it’s a political thriller, and then it’s an action war drama, and then it’s a reflective and unexcited look into… this film takes its motives from “Lions for Lambs”, but also from “Hurt Locker” in that it takes us back into the blunt, hostile and violent reality of fighting a war in Iraq. Most of it is characterized, however, by not being there anymore, by trying to cope with other realities, the post-war intercultural shock back home, and the fact that trust has been destroyed for good. The “hero” ends up not being a hero at all, but merely a man who was deceived first by others, then by himself, and must pay the price for trying follow heroic role models. He learns that life would be terribly easy if we let Hollywood write the script, but is fatally complicated when reality kicks in. 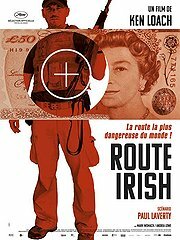 “Route Irish” is not a perfect filom, but it has perfect moments and perfect intentions – and it a Ken Loach film, and that is more than most other film have going for themselves. Watch!